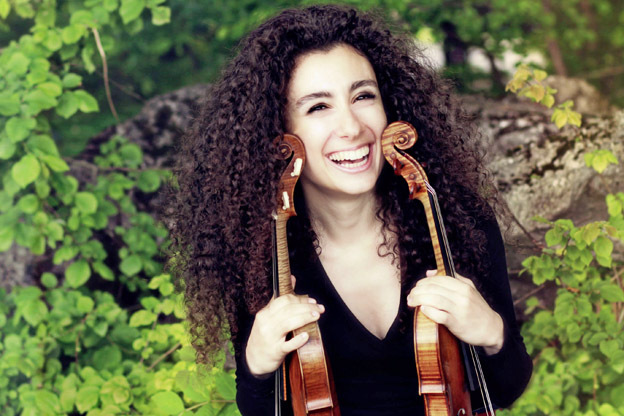 In 2017, French violinist Chouchane Siranossian is a double Award winner of ICMA (International Classical Music Awards), for her CD L’ange et le diable with Jos van Immerseel and as Concertmaster of Ensemble Esperanza. Remy Franck made the following interview with her. Chouchane, your family roots go back to Armenia. What does this mean for your music-making? For sure, my roots have an influence on my playing and even in general on my life. My father is a well-known specialist of this music and his approach certainly had and has an influence on my own music-making. I was born in France, I have grown up in France, so I feel myself as being French, but I have several times been in Armenia and above all I have heard this music at home. When I was a child my grand-parents would sing Armenian folksongs! What is specific for Armenian music? Well, there are specific colours coming from the traditional instruments like the duduk. But at a very young age I was not only familiar with folk music but also with music by Armenian composers like Aram Khachaturian, Arno Babajanian or Tigran Mansurian, whom I personally have met. You were born into a musical family, so was it just normal that you would become a musician? I was born in July 1984, and a few weeks later my father organized, like he did every year, a master-class in Romans, the small town I come from. One of the teachers was Tibor Varga and I have a photo where he is holding me in his arms. Some of the students were hosted by my parents, so from my first days on I was immersed in the violin sound. As far back as I can remember, I played the violin, and Tibor Varga became my first teacher. At a certain stage of your career you became familiar with the baroque music. How did that come about? 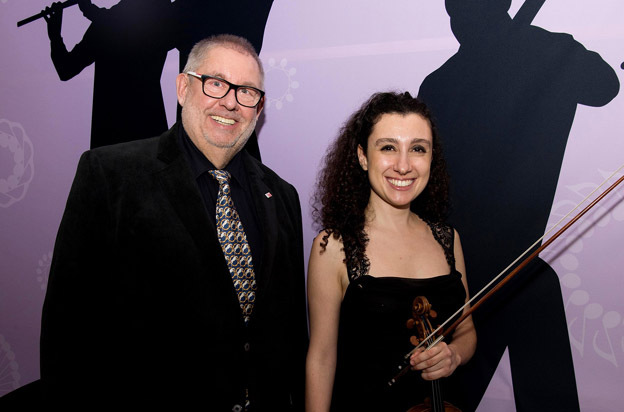 I have made my studies on a modern violin and after finishing my training with Zahkar Bron in Zurich I became concertmaster of the Sankt-Gallen Symphony Orchestra. The chief conductor of that orchestra was David Stern, the son of Isaac Stern. He told me: You are asking yourself so many questions about playing the violin that you absolutely must meet Reinhard Goebel. He will answer your questions. I knew that Reinhard Goebel was a German violinist specialising in early music on authentic instruments, but at that time I had no link to the baroque music. I had played some baroque pieces with a harpsichordist in Zurich, without exploring the music more extensively. So, following David Stern’s advice, I went to see Reinhard Goebel and worked with him for two days. And that changed everything for me! I suddenly felt that there was a whole world I had to discover. I still had a lot of questions, yet without giving concrete answers, Reinhard Goebel directed me to the music, books and sources where I would find the answers. I quit my job in Sankt-Gallen and studied with Reinhard Goebel for four years. The first year was essentially musicological studies. After this year I began playing the baroque violin, but used my newly acquired knowledge also for classical music and even later periods. How did you manage to keep your repertoire varied? At the beginning, for two years or so, I played exclusively baroque music. Then I felt that I did not want to exclude the other music and even the contemporary one, since I liked very much working with living composers. However, all this great violin concertos I had played before, I rediscovered them in a new way. You divide your career between solo playing, chamber music and you are also concertmaster of Ensemble Esperanza. Yes, and I like this variety a lot. When you play baroque music and do it as a soloist, you become automatically a leader, since this music works very well without a real conductor. 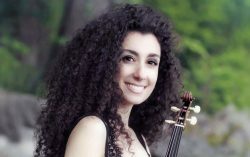 I had a big experience as a solo violinist with various orchestras, but there is a huge difference between this role in a symphony orchestra or in a smaller ensemble. I like to have that responsibility and that’s why I accepted to become concertmaster of the Ensemble Esperanza. Would you like to become one day a real conductor? My mother dreams of it (laughs). I have received some advice from my father who is also a conductor, and if you have a look at the evolution, you see that the conductor’s gestures clearly come from the solo violin. Yet, I need to have a violin with me when I go on stage. Without the violin I would feel …naked. Tell us about your work with the Ensemble Esperanza. It’s a very colourful orchestra, a virtuoso orchestra with only soloists, and my role is to make those soloists playing together. When Drazen Domjanic asked me if I would like to take over this role I thought, how difficult it might be to work with such a bunch of players and all their egos. Yet, I found with all of them such a strong will to play together, such a real love of music, that my role was to canalize all those energies. Esperanza is like a big chamber music group, and they are able to play just everything. It’s such a luxury to work with this ensemble! Since the technical problems are very limited, we can fully focus on the sound. I tell them to not only listen to their own instrument but to listen to the whole sound produced by all of them. That explains why we are able to play pianissimo in a very exceptional manner. When you would play alone with such a minimal sound, one would not even hear it, but altogether we get a sound with a very special quality and colour. When you are leading the ensemble you show a lot of facial expression and your eyes seem to be everywhere in the orchestra. Basically, my bow is the replacement of the conductor’s baton. But otherwise, yes, I have to allow the musicians to come to an interpretative result. They have to watch me, they have to follow the lead in order to allow the flexibility of the musical expression, to make something happen during the performance. Which future do you consider for the ensemble? When I prepared the first project, two years ago, I was really surprised by the result. And now, the question is also for me what development the ensemble can take. As I said, Esperanza is composed by young musicians, so nobody knows which direction they will take individually, but I think for some years we will have a certain potential to play more concerts and to make more recordings. Let’s come back to your own career. You play two different violins, one Gagliano and one Amati. Why two violins? I have one violin set up in the baroque manner, which I use until the beginning of the 19th century, Mozart and Haydn included. The Amati violin is set up for later periods. So this is two really different set ups. On the baroque violin I only use gut strings. But with all the research I have done, I found out that gut strings were used until 1945, so that more and more I am using gut strings for classical and romantic music. With Anima Eterna and Jos van Immerseel I played Ravel and Sarasate on gut strings. Is it difficult to switch from one set up to another? For sure its two different techniques. The fact of having discovered the baroque music has changed my technique a lot, especially my bowing technique, the evolution of which is closely linked to the gut strings. I am using much less vibrato now, and the musical expression comes more from the right hand then from the left hand. However there is still a big difference between playing the baroque violin and the modern one, even when I use gut strings on it. At the beginning, I did not think that the two instruments would be so different, but now I am used to and I regularly play the two instruments in one concert. I never liked to use a lot of vibrato, because I felt that it is hiding a number of things, notably the harmony. But at a certain time I was convinced that for Brahms and Tchaikovsky vibrato could really be profitable. And then I discovered what Leopold Auer wrote about the question. Auer was the violinist for whom Tchaikovsky wrote his Concerto. In his treaty, Auer states that some violinists are using the vibrato at such a degree that it sounds sick. And he decided to remedy the problem, without succeeding. Heifetz and Fritz Kreisler became the two famous violinists getting into a permanent use of the vibrato. Of course I do not pretend that one has to totally eliminate the vibrato. I consider the vibrato as an ornamentation. When one does not use it permanently, the vibrato gets a new and better quality. The vibrato has a great influence on the right hand and at the end, by using less vibrato, one improves the bowing technique. You have had the chance of getting in touch with musicians like Reinhard Goebel and Jos van Immerseel, a fact that probable influenced your career? Indeed, in my life there is a period before Reinhard Goebel and a period after Reinhard Goebel. In order to work with him I stopped my career at a certain moment and had to rethink over everything, to challenge myself on the basis of new targets. At that moment I had all possible diploma, but I came to the conclusion that I didn’t know anything. Undoubtedly it was a shock, but at the same time a blessing. I got such a thirst of discovery! Reinhard also told me: You must know if you go all that way long, there is no way back. I took the risk and I really do not regret it. Not everybody might appreciate that way, but I consider it as a new way, a new way of thinking and playing. It allows to stay close to the text, to remain faithful to the composer and at the same time to be creative and flexible. One more thing is very important: there is no general recipe. You have to study each composer and each work individually on the basis of every available information. In which way will this influence your future? For your recording L’ange et le diable’ you won the ICMA award in the category ‘Baroque Instrumental’. What does this mean to you? It is pure bliss! At the same time it is a confirmation that I was right in taking a new direction and to start all over again. How was the collaboration with Jos van Immerseel? I have played a number of times with Anima Eterna and always had a good and fruitful relation with Jos van Immerseel. So, when he came up with the idea of this recording, I was immediately hooked, and it was a great collaboration. Doing this project with him was certainly a luxury. You receive mainly tremendous reviews in the international press. Which relation do you have with reviews? Reviews are a mirror of what we do as musicians. There are positive reviews and less positive reviews and I think one can learn from all of them. Reinhard Goebel even uses to say that it’s from bad reviews that one can learn most. When Deutsche Grammophon published his recording of Bach’s Brandenburg Concertos he had to face some really virulent criticisms. He cut the worst of the bad reviews from the newspaper, had it framed and put it on the wall in his studio… Personally I think that one definitely has not to question everything after a bad review, but one can learn something from each review. How do you establish your relation with the audience? I have grown with the audience. With my father being a conductor I went to a lot of concerts when I was a child. And when we had guests at home, which was the case nearly every day, my father would invite me and my sister Astrig, who plays the cello, to perform for the guests. That gave me a great confidence. I adore being on stage! The audience and the musician always share something. We give something to the audience and the audience gives us something back. Yes, I can feel those differences. And that’s why I like to address the audience, to establish a relation with the people in the hall. The audience is not supposed to be passively listening, but to give signals to the musicians, so that we can react. If we see that no signal is coming, we have to do something about the situation to get full attention. Are you concerned by the prediction that classical music is dying? The death of classical music was already announced 50 years ago. 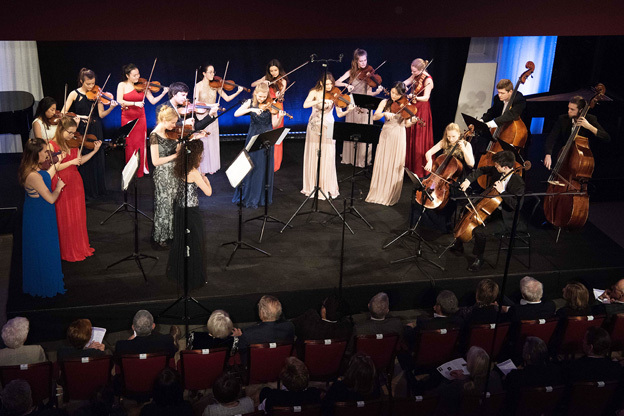 Nonetheless the musicians have to question themselves and their programs and to think about topics like ‘why do people fear to go to concert?’ or ‘why do young people avoid classical concerts?’ and so on. Some baroque composers wrote some measures of insignificant music after a brilliant solo, to allow the audience to applaud the soloist. Today I have the impression that the audience is afraid of reacting. And therefore I think, we musicians need to establish a better relation with the audience to put the people at ease and to let them know that they have not to sit there like frozen.